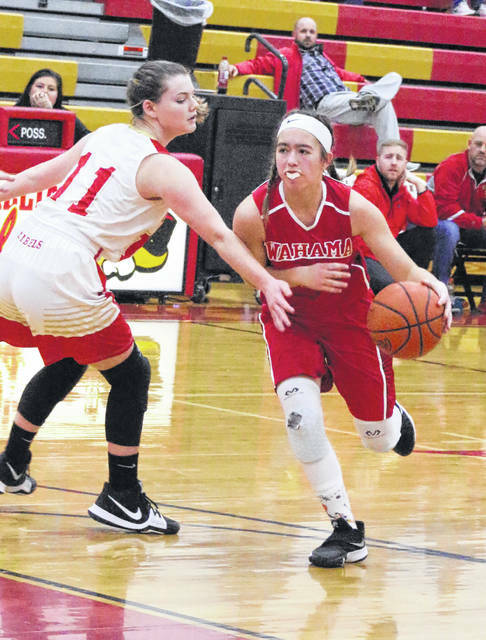 Wahama junior Hannah Rose dribbles past a South Gallia defender during a Jan. 3 girls basketball contest in Mercerville, Ohio. CHARLESTON, W.Va. — Wahama junior Hannah Rose was the lone Mason County athlete chosen to the 2019 Class A all-state girls basketball team, as voted on by members of the West Virginia Sports Writers Association. Rose — a 5-foot-6 guard — led the Lady Falcons in scoring with 19.9 points per outing. Wahama finished the year with an 11-13 overall record after winning the same amount of games in their previous five seasons. It is the second straight all-state selection for Rose in basketball as the program’s eighth 1,000-point career scorer was once again chosen to the honorable mention list. Paige Shy of Huntington Saint Joseph was named the first team captain, while Terra Kuhn of Tucker County was the second team captain. Jenny Wilson of Midland Trail was the third team captain. Paige Shy, Huntington St. Joe (captain); Eden Gainer, Wheeling Central; Madeline Huffman, Parkersburg Catholic; Dena Jarrells, Huntington St. Joe; Bailee Adkins, Huntington St. Joe; Aaliyah Brunny, Parkersburg Catholic; Reagan Sharp, Trinity; Gavin Pivont, Summers County. Terra Kuhn, Tucker County (captain); Kyndra Pilant, Magnolia; Taylor Isaac, Summers County; Mady Winters, Magnolia; Kaylee Reinbeau, Wheeling Central; Taylor Martino, Notre Dame; Andrea Alimario, Madonna; Leslie Huffman, Parkersburg Catholic. Jenny Wilson, Midland Trail (captain); Abi Haught, Ritchie County; Kaylea Baisden, Tug Valley; Sarah Jude, Tolsia; Dejah Busby, Sherman; Savannah Bailey, Montcalm; Hannah Foster, Valley (Fayette); Josey Jones, Tyler Consolidated. Julie Agee, Greenbrier West; Bethany Arnold, Williamstown; Trinity Bancroft, Gilmer County; Kira Bircher, Pocahontas County; Rachel Boniti, Madonna; Julie Boone, Tolsia; Aquera Cabral, Magnolia; Laila Calhoun, Pocahontas County; Leighton Croft, Trinity; Jenna Dallison, Valley Wetzel; Abby Darnley, Buffalo; Emily Dickerson, Midland Trail; Izzy Erb, Williamstown; Riley Evans, Tucker County; Addie Furr, St. Marys; Hannah Grove, Gilmer County; Brianna Hefner, Pocahontas County; Emilee Henderson, Notre Dame; Marissa Horan, Wheeling Central; Shelby Howard, Ravenswood; Bianca Howell, Doddridge County; Jordyn Hughes, Cameron; Peyton Kocher, Tyler Consolidated; Karlie LaFauci, Van; Hannah Loy, Paden City; Madge Lucey, Cameron; Makayla May, Tug Valley; Kennedy Martin, Madonna; Erica Merrill, Summers County; Emma McKeen, Notre Dame; Grace Mitchell, Greater Beckley Christian; Josie Montgomery, Calhoun County; Mckinley Murphy, Tucker County; Caraline Nelson, Sherman; Alyssa Newsome, Tug Valley; Mara Rinehart, Williamstown; Lindsey Rinker, Moorefield; Hannah Roberts, St. Joe; Cassidy Roles, Fayetteville; Hannah Rose, Wahama; Rachel Rosen, Trinity; Kylie Saltis, South Harrison; Cameron Smith, Doddridge County; Abbe Stackpole, Paden City; Caitlyn Underwood, Valley Wetzel; JoLee Walton, Tyler Consolidated; Hannah White, Wheeling Central; Kylie Wright, St. Marys; Emma Wyer, Wirt County.